A book for makers, for seekers of all kinds, an exhilarating look into the heart and soul of artisans—and how their collective wisdom can inspire us all. In this joyful celebration of skilled craftsmen, Eric Gorges, a corporate-refugee-turned-metal-shaper, taps into a growing hunger to get back to what’s real. Through visits with fellow artisans--calligraphers, potters, stone carvers, glassblowers, engravers, woodworkers, and more--many of whom he’s profiled for his popular television program, Gorges identifies values that are useful for all of us: taking time to slow down and enjoy the process, embracing failure, knowing when to stop and when to push through, and accepting that perfection is an illusion. 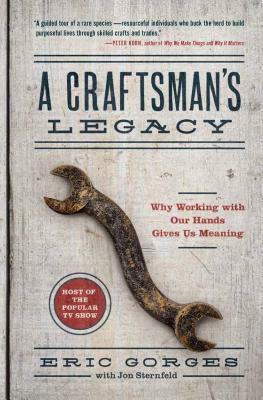 Most of all, A Craftsman’s Legacy shows how all of us can embrace a more creative and authentic life and learn to focus on doing what we love. Eric Gorges has been the host of A Craftsman’s Legacy since it began in 2014. After a health crisis caused him to reevaluate his life, he sought out one of the best metal shapers in the country and signed on as his apprentice. In 1999, he struck out on his own, opening the custom motorcycle shop, Voodoo Choppers, in Detroit, Michigan, where he lives today.